It was fun to see the film again after all these years and it brought up some fun memories from working on the film. Under my company, David Stipes Productions, I was able to bring together some terrific talented people to work on the project. Celebrated concept artist and illustrator Steve Burg designed the spaceship. 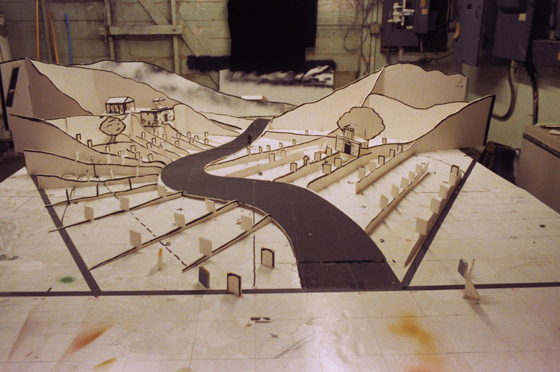 Burg and Emmy award winner Ron Thornton constructed the model. 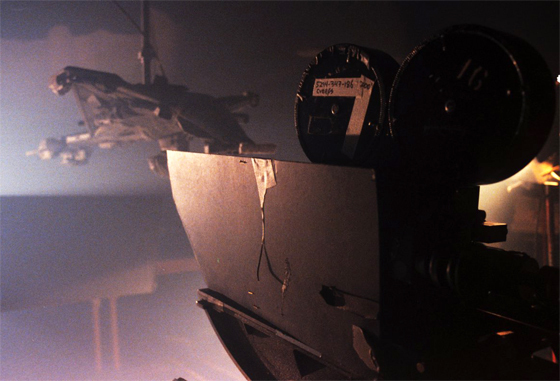 Creeps spaceship being filmed in a smoke room to simulate foggy night. Model maker, and later director, Dale Fay constructed the alien cylinder that contained the creeps. One of the aliens running with Creep cylinder by Dale Fay. 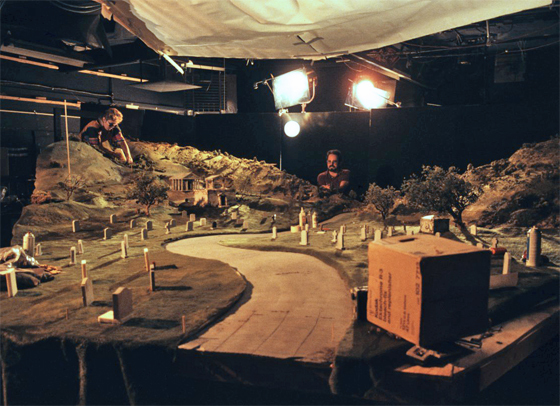 Famed “Star Wars” vet, David M. Jones, supervised the construction of a huge forced perspective cemetery set for the film’s finale. This is a small scale mock up David Jones built to show concept. David Jones in center overlooking his work. Joanne Walker adds details to the left. Michael Karp provided motion control programming. Motion-control machine work and rigging was created by Richard Bennett. I was the visual effects supervisor and producer for my company’s portion of the effects work. I also created the motion graphics elements for the laser blasts and spark effects at the beginning of the film. There are a couple of interesting facts: only the bottom half of the spaceship was constructed as that was all that the audience ever saw. 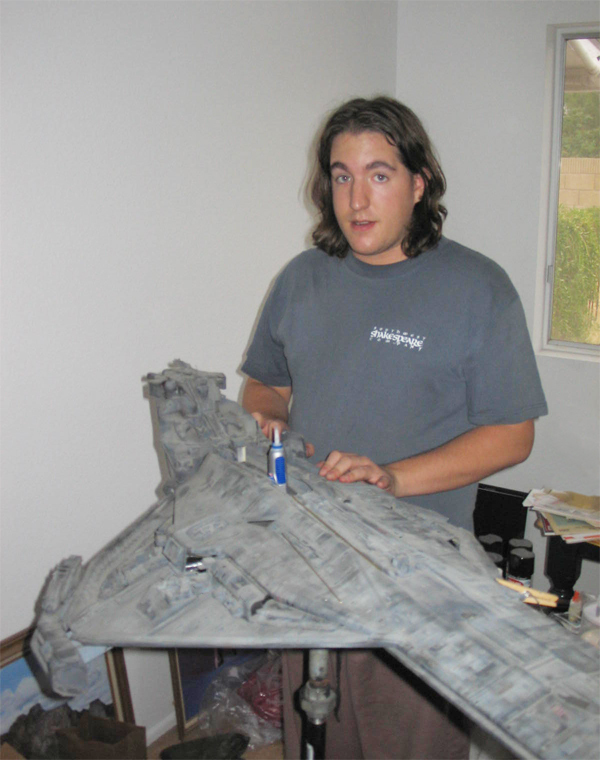 Nathan Stipes refurbishing Creeps ship in 2005. The Creeps spaceship was used in a “Star Trek: The Next Generation” episode. Fred Dekker later worked as a consulting producer / writer on “Star Trek; Enterprise.” In 2001, I was a visual effects supervisor on the show for two episodes. I was excited to see Fred’s name on the production crew list. It was fun seeing his face when I reintroduced myself after almost 15 years. I had some dates that were creeps! They would have been more fun for me if the guys had been dead. Most of them were like live octopi. In all seriousness, you’ll have to bring this one over. I haven’t seen it. Awesome model shot! That is the kind of miniature I like! HUGE! I’ll have to go out and get this movie! Oh wow I remember this movie. Saw it late one night on cable when I was a kid and it scared the heck out of me. Caught it again about 10 yrs later on cable again. This version had the cemetery ending. Very cool shot. Kept wondering why it never had this ending the first time I saw it. Wasn’t the Creeps ship used as the Promellian battle cruiser on The Next Generation episode ” Booby Trap “. I think it was also used again in a first season episode of DS9. Yes the ship was used on TNG and DS-9. 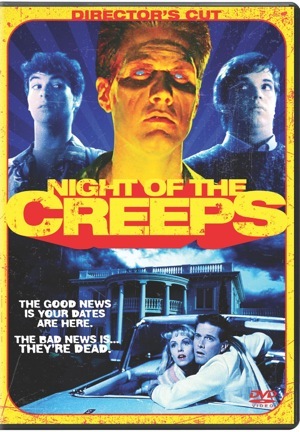 The “Night of the Creeps” producers were very kind to share the ship with Trek. Wikipedia has an article on “Creeps” and details some info about the two endings. I was almost done with the final shot when it was cut from the film’s ending. It still needed final compositing. Fred asked me to finish it in case he could add it later, which he did. I remember seeing those little wormy things around Ted Rae’s shop. Ted, as usual, did a great job on the film! Very cool!! I’ll have to go pick me up a copy! It is a fun film, full of goofy makeup, situations and effects. Besides TNG:”Booby Trap” (as a Promellian Battle Cruiser} the DS9 episode David refers to were “Sanctuary” (as a Skrreean starship) and “Sons of Mogh” (as Noggra’s shuttle} although I seem to remember they having an upper structure…Funny those connections this film has with “Star Trek”. I think I’m gatting me a copy…Nice post again, David, Thanks. It is good to see Creeps getting some publicity finally. Any chance you have more photos of the spaceship model? I’d love to try and build a replica.